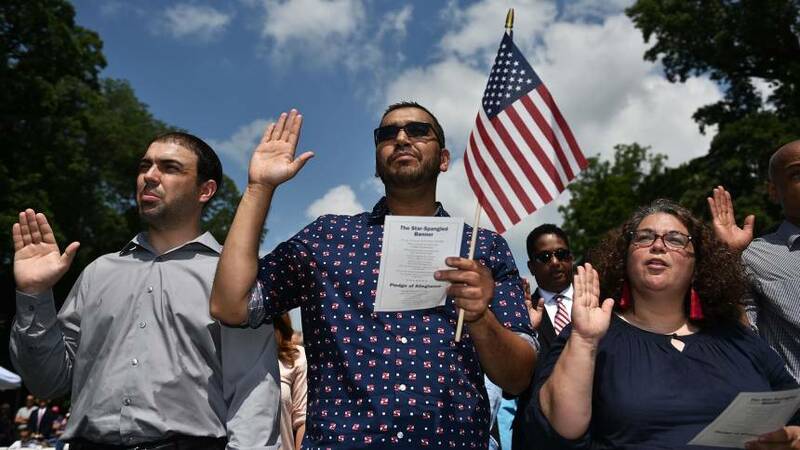 Hot and muggy temperatures cast a sticky shadow over many Fourth of July celebrations on Wednesday, while dangerous wildfires forced residents to spend the holiday out of their homes and an immigration protest shut down access to the Statue of Liberty. 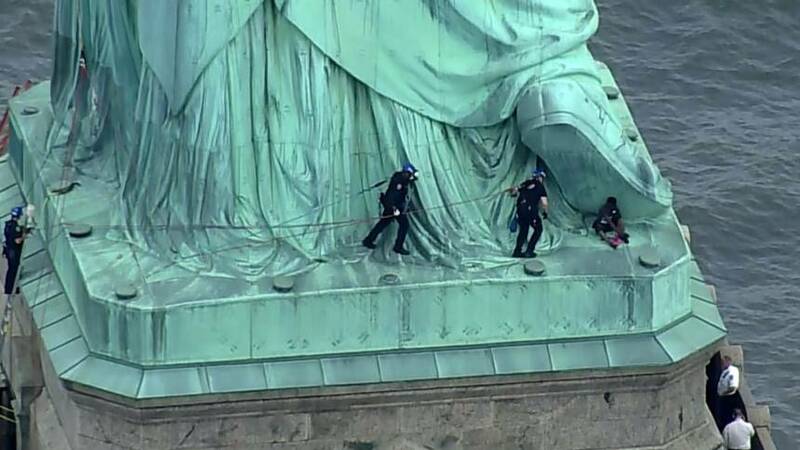 Holiday visitors to Liberty Island had to change their plans as authorities evacuated the landmark as a precaution after a protester scaled the base of the Statue of Liberty. NBC New York reported that the demonstrator, identified by the National Park Service as Therese Patricia Okoumou, 44, of Staten Island, said she wouldn’t come down until children separated from unauthorized parents at the U.S.-Mexico border were reunited. Authorities who scaled the base apprehended her shortly after 6:30 p.m. The activist group Rise and Resist said that Okoumou was a participant in a protest at which members of the group unfurled a banner at the base of the monument but that she acted on her own. The banner read “Abolish ICE,” a reference to a movement to eliminate U.S. Immigration and Customs Enforcement amid criticism of its crackdown on undocumented immigrants. “We understand and share her desire to see the immediate release of children from detention and reunion with their parents,” the group said in a statement. Members of the New York Police Department’s elite Emergency Services Unit said at a news conference that they’ve conducted rescue training on the statue but that this operation was difficult because “there was nothing for us to grab” for stability, said Detective Brian Glacken, one of two officers who first made contact with Okoumou. He said rescuers moved slowly, ensured that they were shored by rope lines and then approached the woman, at which point she had nowhere to go. “She actually apologized to Chris and I for having to go up there to get her,” he added, referring to Detective Chris Williams, the other officer who first contacted the demonstrator. Nearly everywhere else, July 4th celebrants braved the heat. In the eastern part of the United States, where at least one death was blamed on a nearly weeklong heat wave, 98 million people were under heat advisories or warnings, NBC meteorologist Dylan Dreyer reported. And while the heat was expected to subside in the East by the weekend, it was expected to cause only more trouble as it headed west — where multiple wildfires have caused thousands to flee. In eastern Utah, hundreds of residents had evacuated as of Wednesday morning and about 30 homes had been lost to the Dollar Ridge fire, an out-of-control wildfire that had reached 40,469 acres, according to NBC affiliate KSL of Salt Lake City. 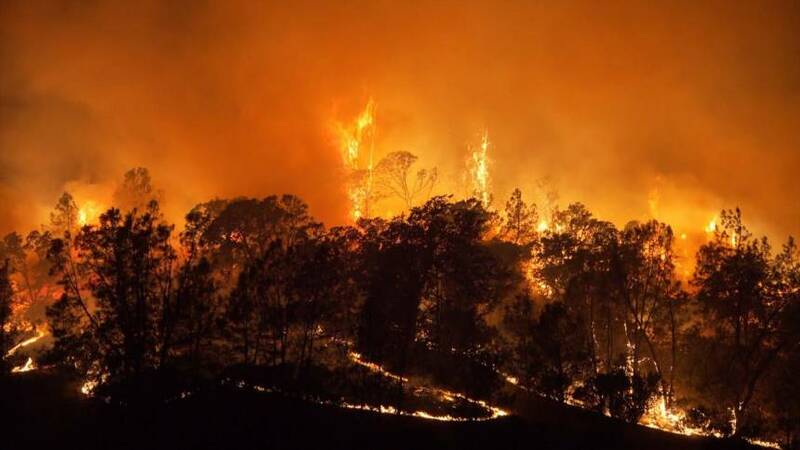 The Dollar Ridge fire is the largest of several fires burning across the state. On Tuesday, Gov. Gary Herbert warnedresidents on Twitter not to light any fireworks on federal, state or unincorporated land because of “extreme fire danger” in the state. Meanwhile, in Colorado, the Colorado Springs fire grew on Wednesday to 94,125 acres and was only 5 percent contained, according to NBC affiliate KUSA of Denver. It destroyed 104 homes, making it one of the most destructive fires in state history. In total, nearly 60 active fires are burning across the West, according to the National Interagency Fire Center, including nine in New Mexico and six in California. At least 44 fireworks shows were canceled across Colorado amid the risk of more fire, KUSA said. On New York’s Coney Island, reigning champ Joey Chestnut handily won the annual Nathan’s Famous July Fourth hot dog eating contest by downing 74 frankfurters in 83-degree temperatures that felt like 91 degrees, according to the National Weather Service. In Washington, D.C., where Wednesday’s highs were forecast to be in the low 90s with a heat index around 100, free performances and a fireworks show on the National Mall were going on as planned. Security was tight across the country for the holiday. In Chicago, 1,500 additional police officers were dispatched ahead of the holiday weekend in hope of preventing violence. In Pittsburgh, officers were doing bag checks at Point State Park, where thousands were expected for fireworks and other festivities. In New York, home to the biggest fireworks celebration in the country, police divers were sent into the East River to ensure that there had been no sabotage to the fireworks barges. In New Carlisle, Ohio, July 4th revelers had a special reason to celebrate: On Saturday, the cash-strapped city will hold a Fourth of July fireworks show for the first time in more than a decade, made possible in part by the newly elected City Council, which allocated $10,000 for it, the Springfield News-Sun reported. Celebrations turned tragic in Illinois on Tuesday night when two people were killed and several others were injured after a branch fell on spectators during a fireworks show. Rock Island County Sheriff Gerald Bustos said Wednesday that Daniel Mendoza Sr., 61, of Rock Island was pronounced dead at the scene. Lawrence R. Anderson, 72, of Moline died at a hospital.